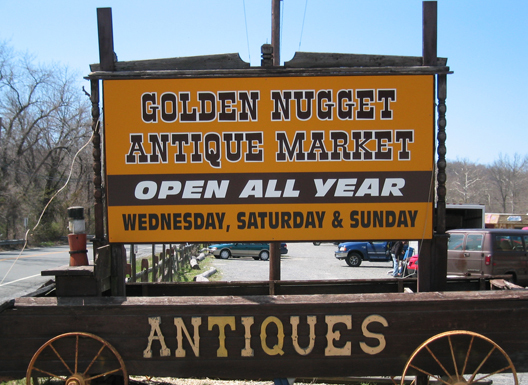 Golden Nugget Antique Flea Market, a 50-year-old Lambertville institution that is open year round. Since 1967, the Golden Nugget has been a “gold mine” for finding antiques, collectibles, art and more. This is not your everyday flea market. Lately, the crowd of buyers includes the faces of a younger and diverse group of people. Young adults are frequenting the Golden Nugget looking to blend store-bought items with a bit of their own nostalgia to create an eclectic mix of styles that reflect who they are now, as well as where they came from. Always on the hunt for treasures, flea market shoppers love the joy of the hunt and the lure of the bargain. Unlike internet shopping, customers can touch, smell and closely examine merchandise to find that unique piece that brings back a special memory and personalizes a home. You are encouraged to ask questions and learn about what you are buying. If you are looking for something specific, by all means, ask. Most exhibitors have merchandise in other locations and may not carry all their items with them. Also, many may have different merchandise at different times of the year. We have two ATMs on site as well as two restaurants where you can take a lunch break or enjoy a variety of refreshments at fair.